« Any difference between intelligent design and evolution? 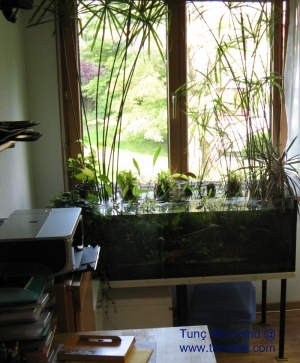 I have at the moment four aquariums; one in the living room, three in the study. 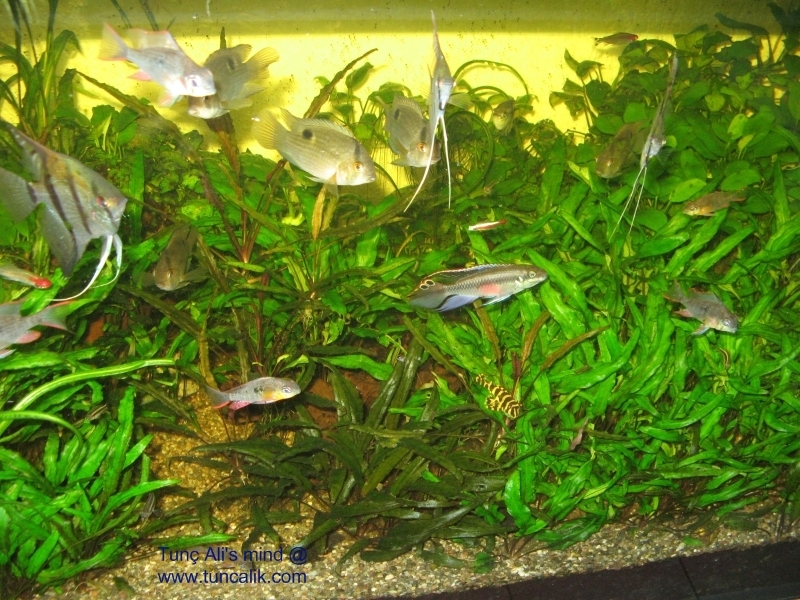 All of them are quite large aquariums with 200 liters or more water capacity. 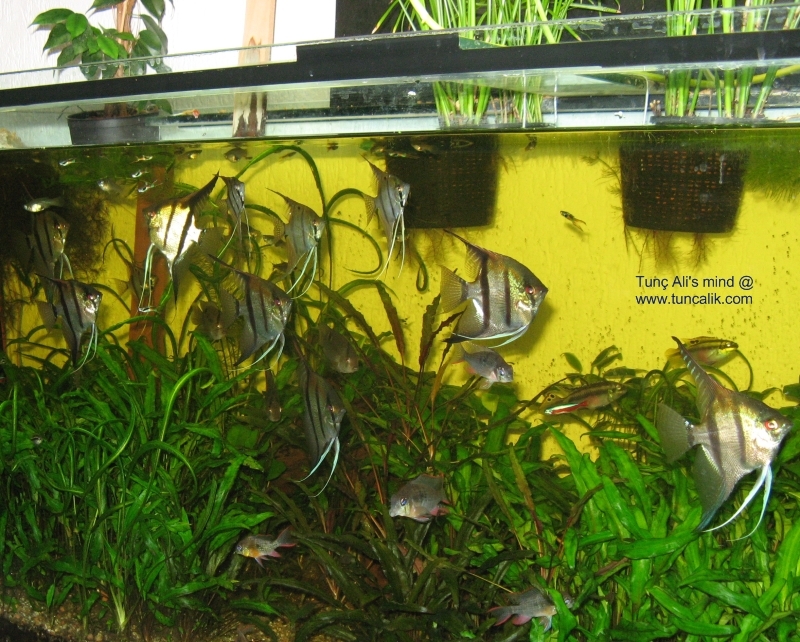 This is a somewhat overcrowded community aquarium with variety of relatively peaceful cichlids like Colombian angelfish (Pterophyllum scalare), Bolivian Ram (Microgeophagus altispinosa), keyhole cichlids (Cleithracara maronii), and other species like endler guppies (Poecilia reticulata), bottom dwellers bristlenose (Ancistrus dolichopterus) and zebra catfish (Peckoltia sp. L134). 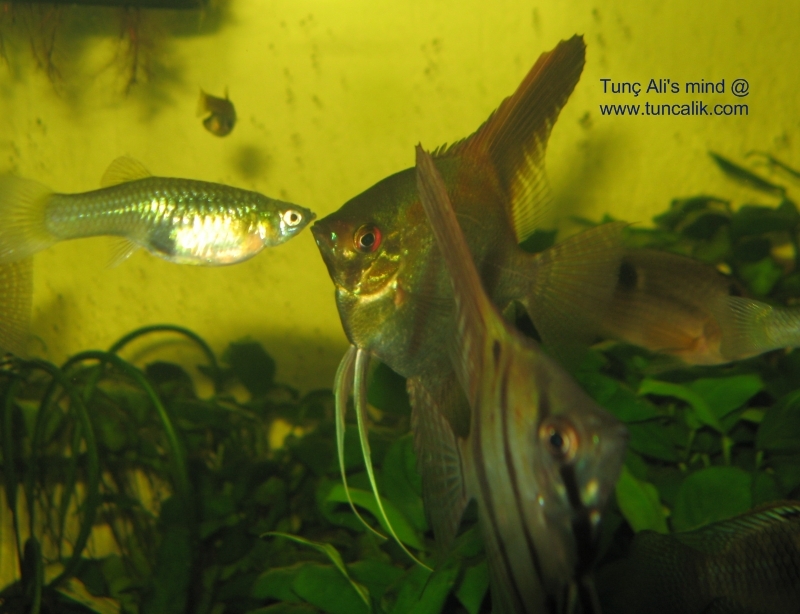 There are also several swarm fish like neon (Paracheirodon innesi) and red nose tetra (Hemigrammus bleheri) though their numbers are decimated from year to year, and I don’t bother to buy new specimens. 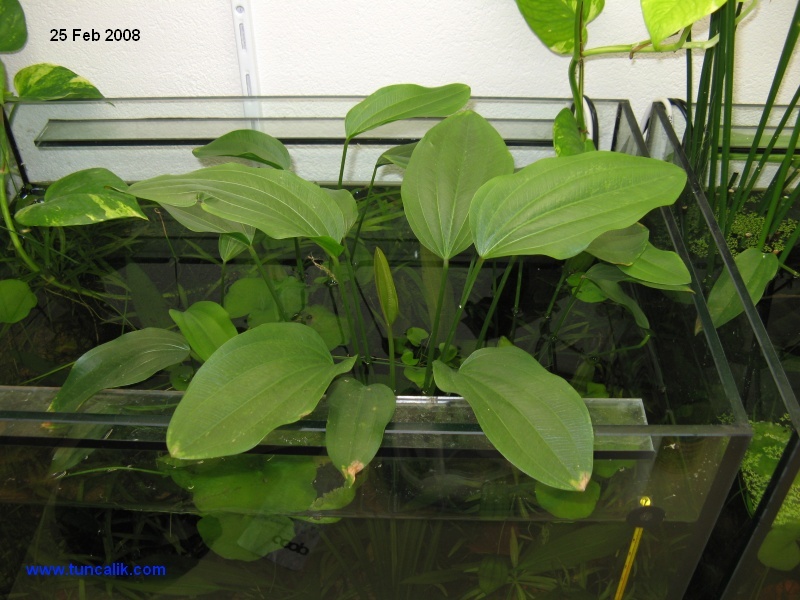 The submergent (underwater) plants are Cryptocoryne and Anubias species. 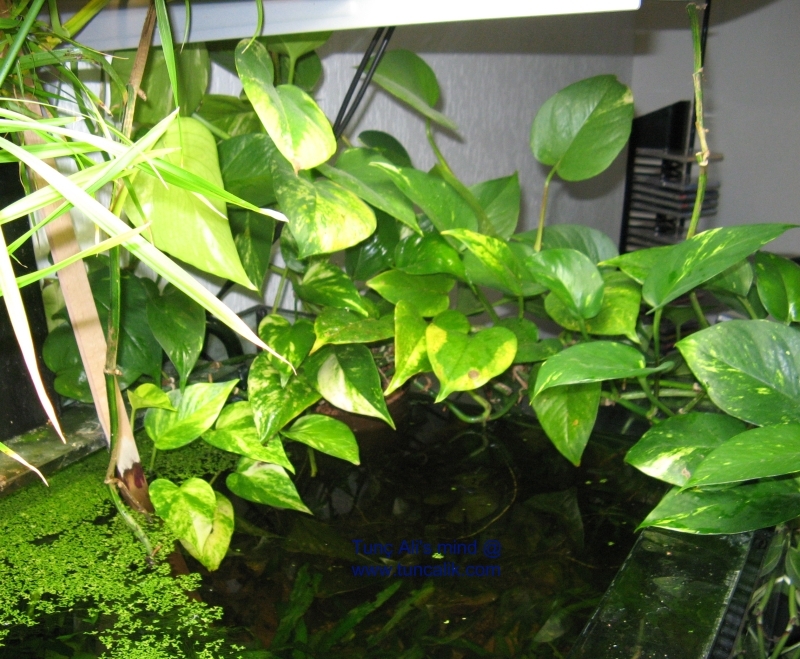 I use emergent plants like satin pothos (Scindapsus pictus or Epipremnum pinnatum), creeping fig (Ficus pumila), umbrella plant (Cyperus alternifolius) and weeping wig (Ficus benjamina) as water purifiers and beautifiers. 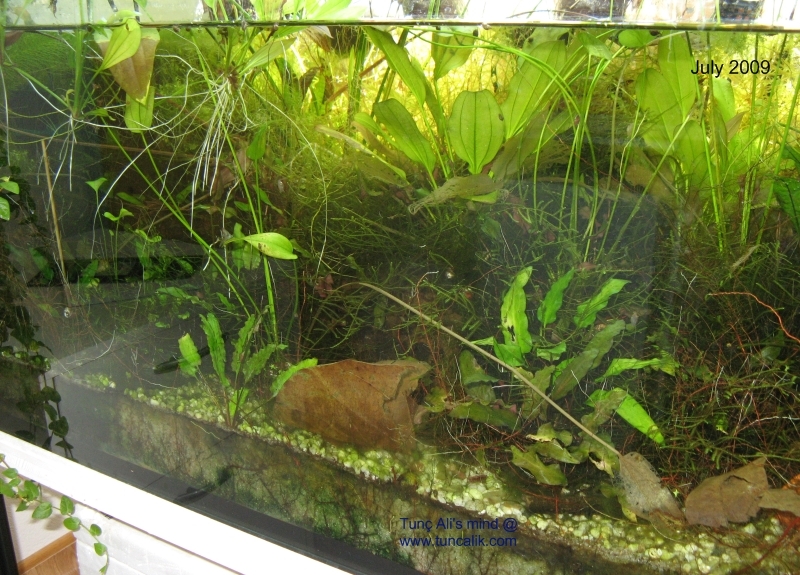 Thanks to these plants water remains surprisingly clean (nitrate below 25 mg/liter), and the fish seem to be quite healthy although the aquarium is definitely overcrowded. 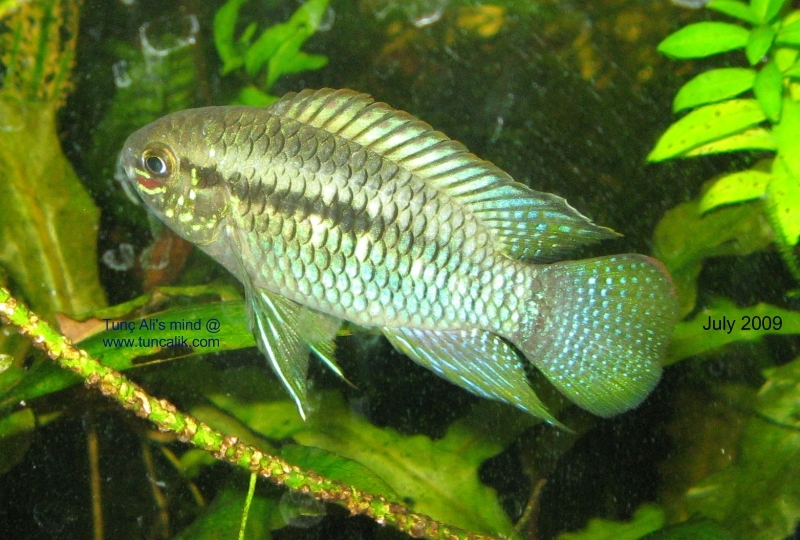 Nevertheless, starting from large flag cichlids some fish must be given away. 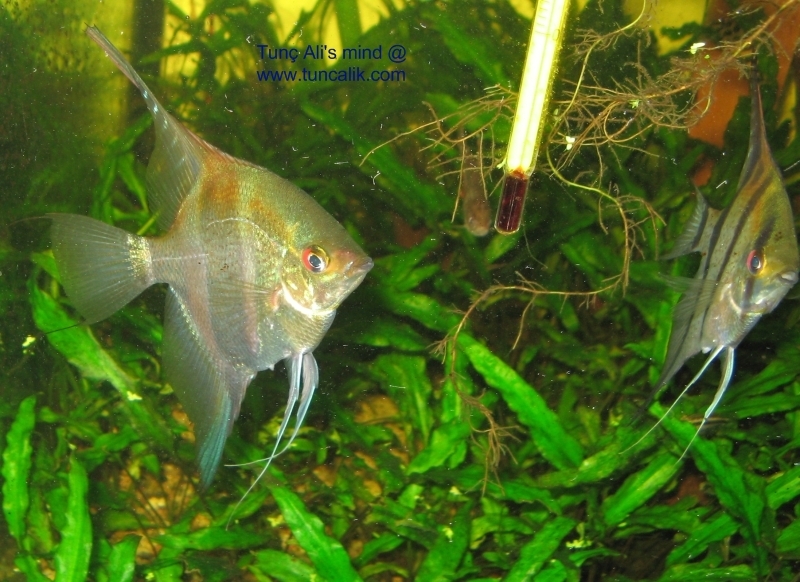 Otherwise the 10-month old angelfish which will soon become territorial adults will have no space to live in peace. 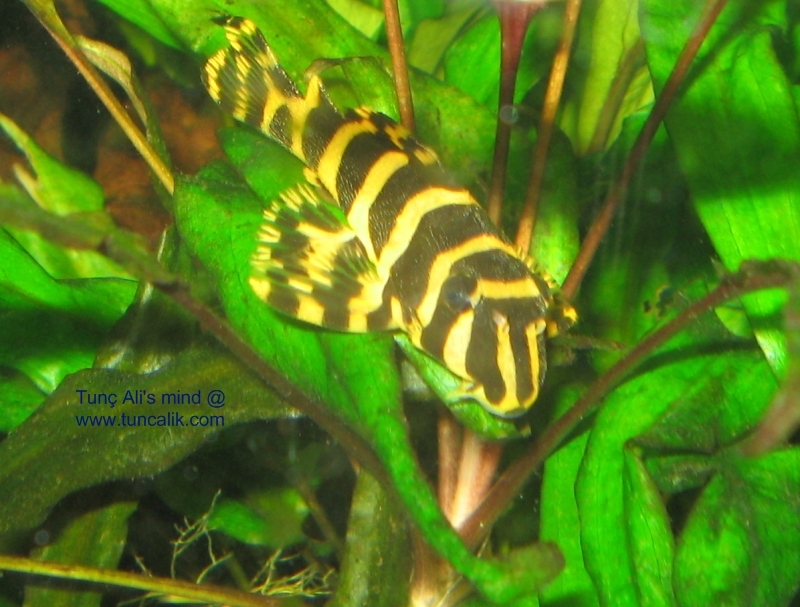 You may find below snapshots from this community aquarium. 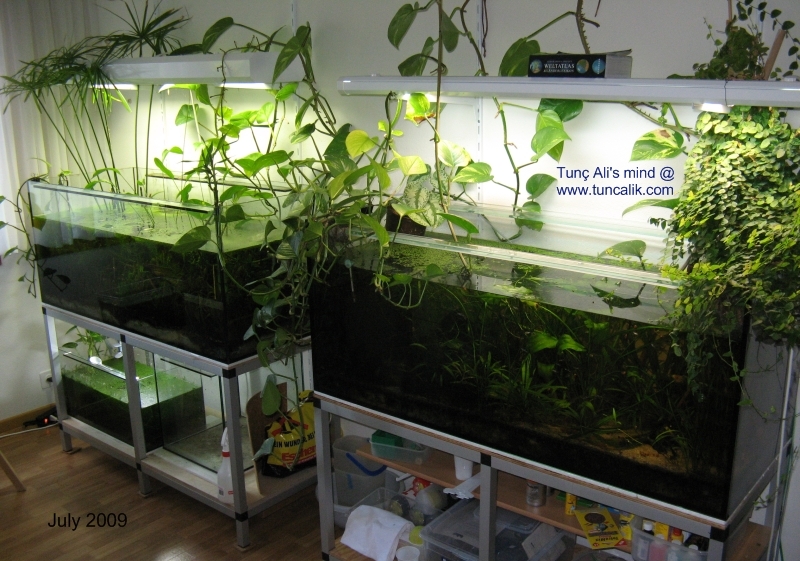 This is the aquarium I like most; a living example of maximum ecology minimum technology. 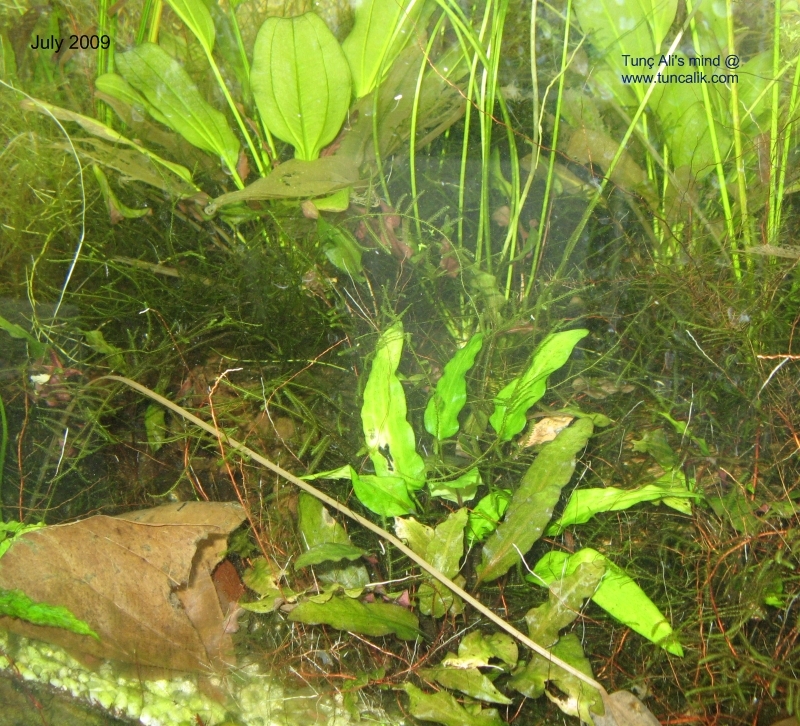 It has no heater, no filter, no air pump, no artificial lighting, no noise, nothing as to technological ugliness… Only plants, crustaceans like cherry dwarf shrimps (Neocaridina denticulata) and Hyalella azteca (a detritivorous and herbivorous decapod), snails, a couple of algeaters (Ansictrus sp.) 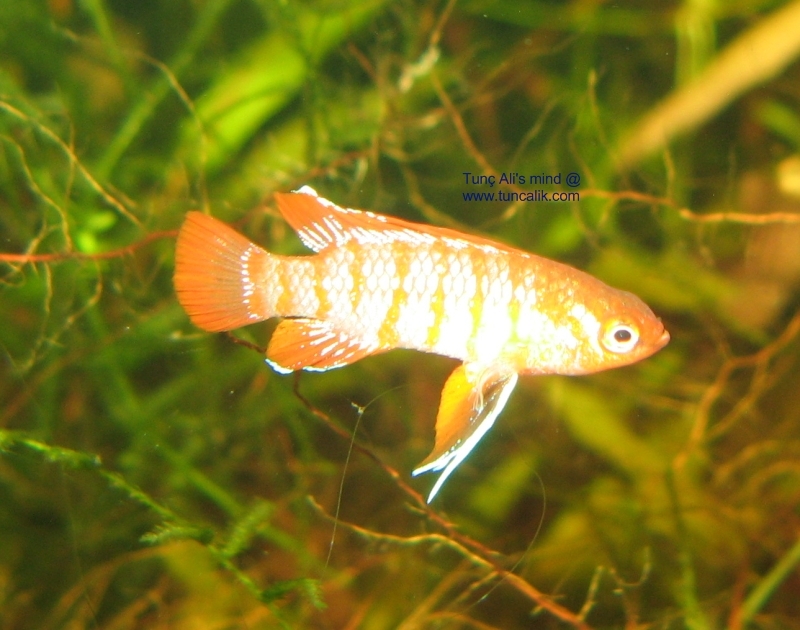 and a group of lovely dwarf fish Dario dario with a maximum size of 2.5 cm. 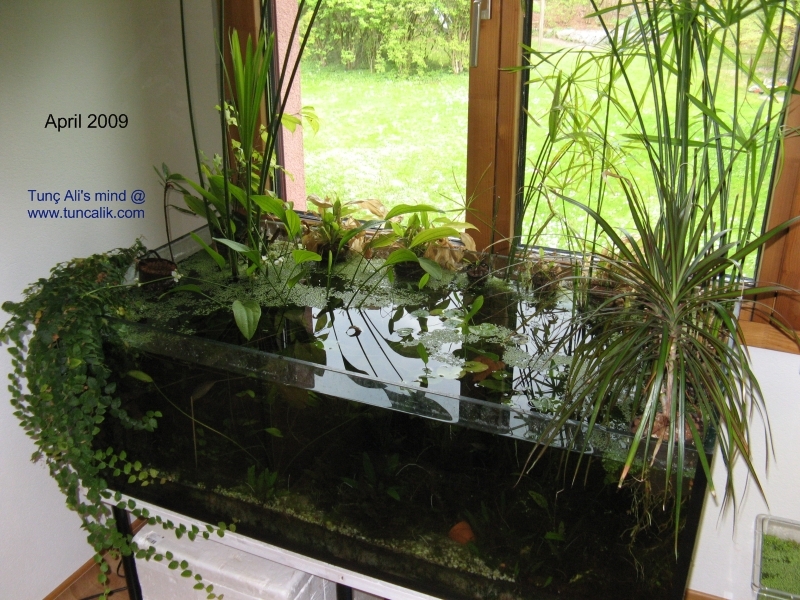 This aquarium is an almost self-sufficient ecosystem similar to natural garden ponds. 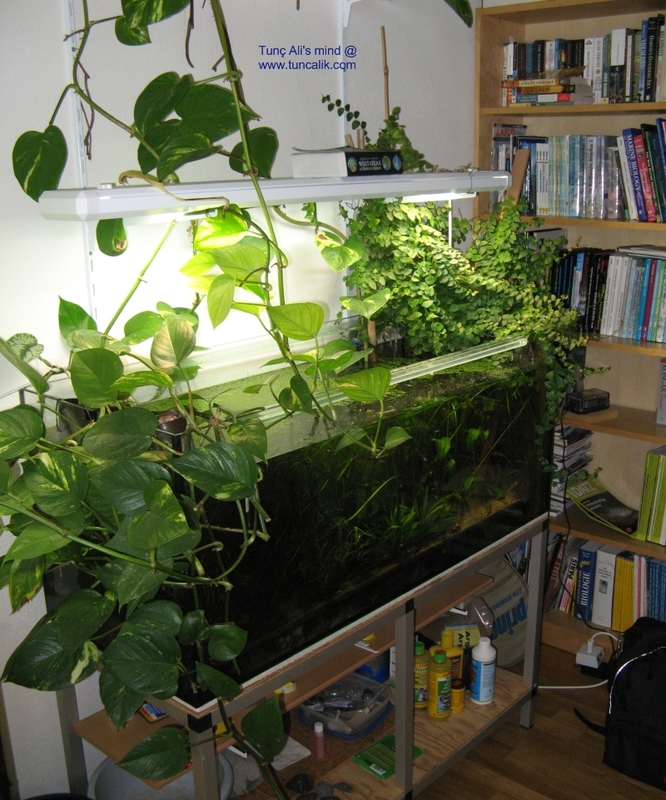 It receives sunlight from the window. 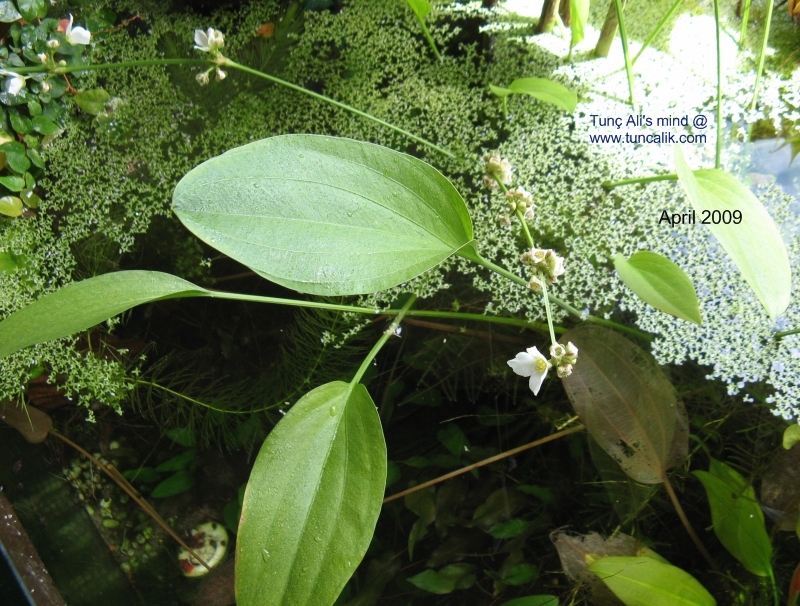 I give no fish food at all except for occasionally dried leaves from the nearby wood, potato and carrot leaves for the herbivorous animals which make the foundation of the food chain. 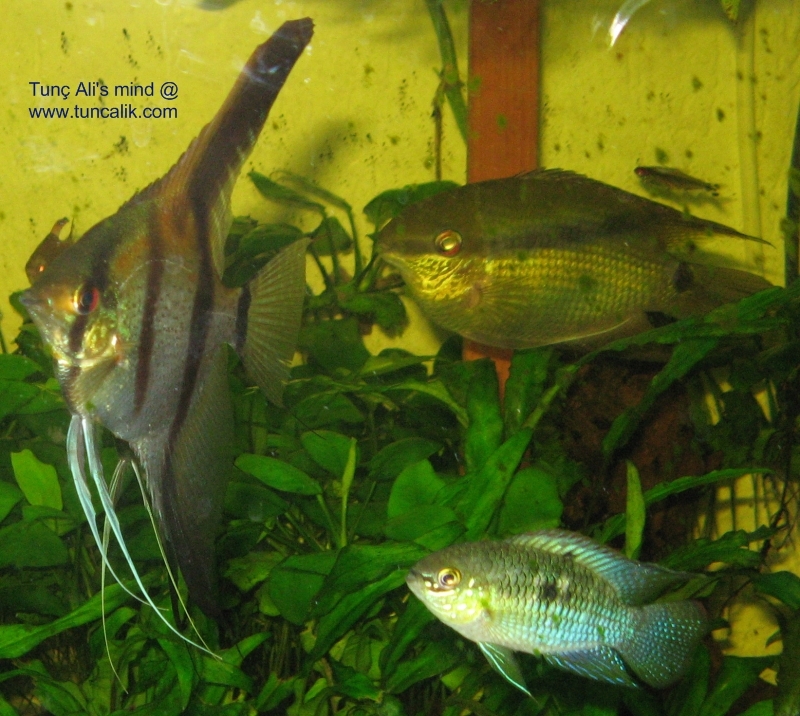 Watching such an natural aquarium is a totally different experience than the usual overstocked industrial aquariums with lots of technological man-made tools and equipments. 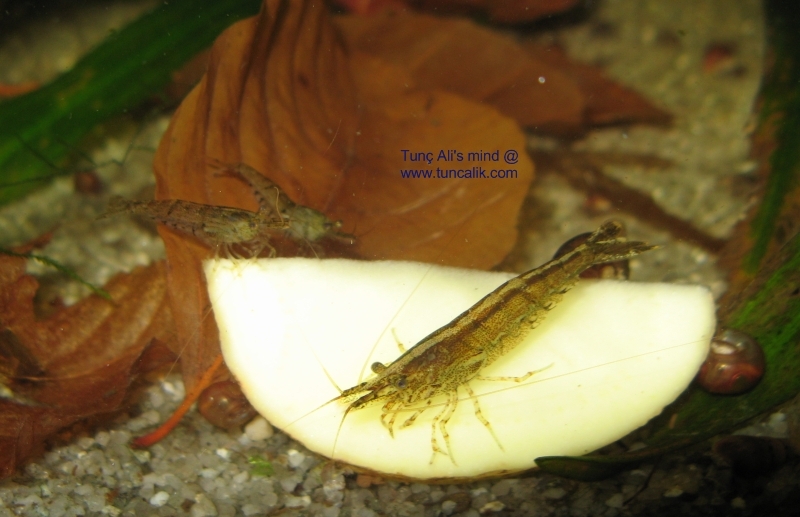 Fish or shrimps don’t show up in front of you as if in a vitrine; most of time they hide among plants and woods. You have to wait and search them in the aquarium. Dario darios usually appear early in the morning or late in the afternoon. 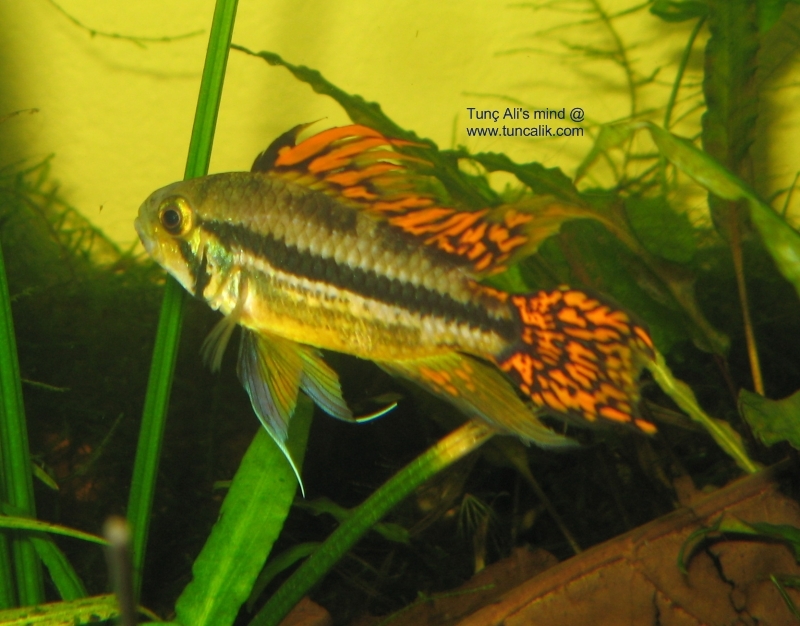 I wrote two years ago, in 2007, a long article about this aquarium in Turkish with pictures and videos (see Odamdaki biyotop). I will soon publish a similar article here in English with new pictures and videos. I can’t call it a low-tech aquarium because it has an air pump driven sponge filter and artificial lighting. 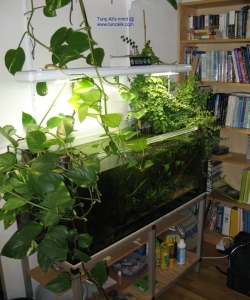 Nevertheless, it is a low-maintenance aquarium because I leave water purification to plants like satin pothos (Scindapsus pictus) and creeping fig (Ficus pumila) instead of using elaborate high maintenance filters or making frequent water exchanges. There’s no heater; temperature varies between 20-26 Celcius. 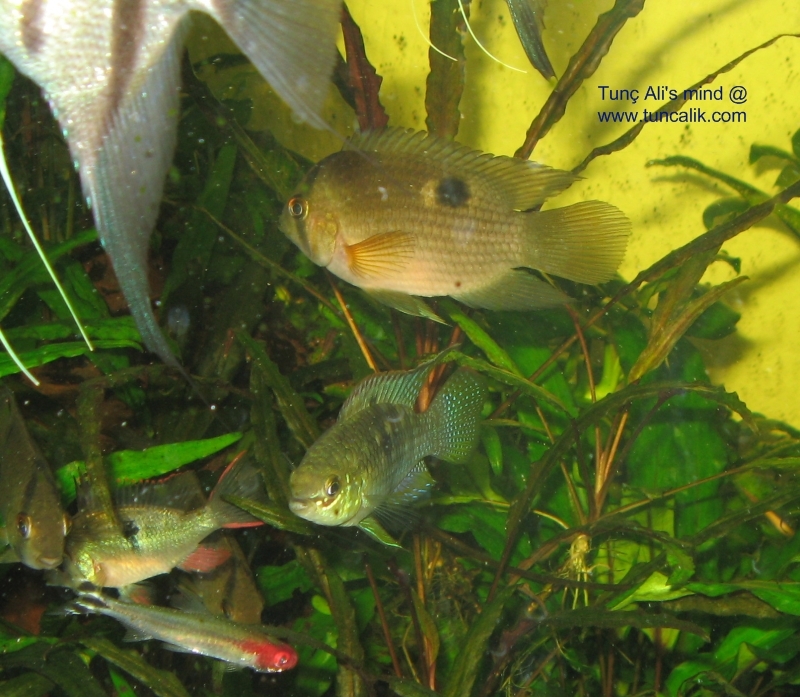 Yellow dwarf cichlids (Apistogramma borellii) live together with lots of guppies (Poecilia reticulata) and several bristlenose algeater catfish (Ancistrus dolichopterus). 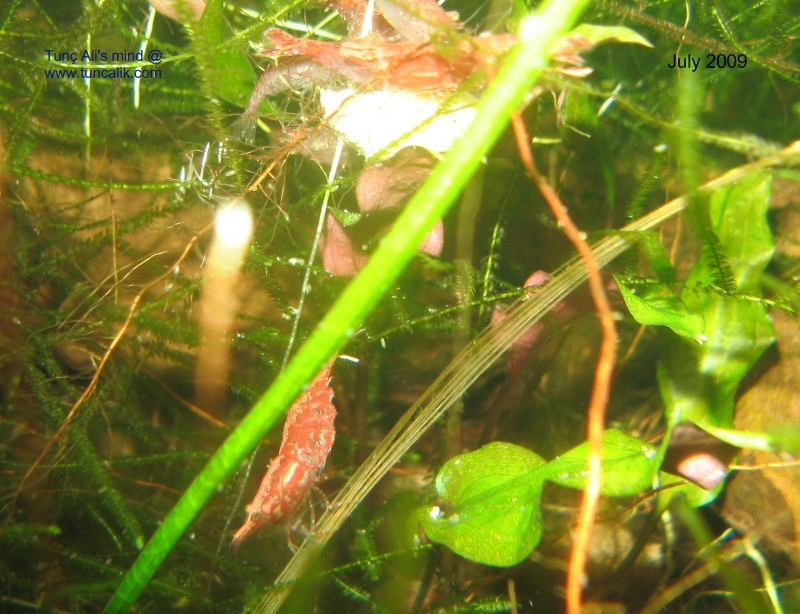 Dwarf shrimps (Neocaridina denticulata) and snails work as voluntary recycling agents. 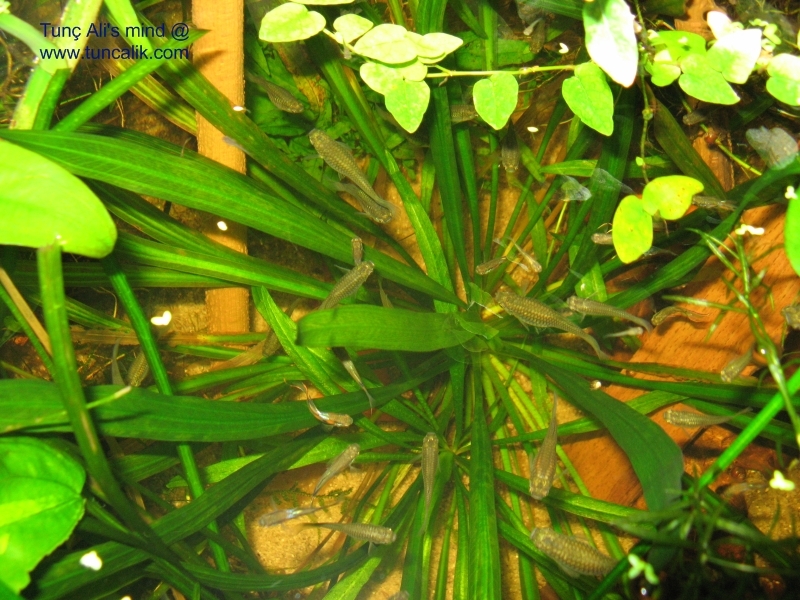 The only sustainability problems in this aquarium are fast growing underwater plants like waternymphs (Najas conferta) or hornwort (Ceratophyllum demersum) which must be regularly pruned, and fast breeding guppies. The accumulation of organic deposits on the sand is a sure sign that the recycling is lacking behind and the aquarium is overloaded. 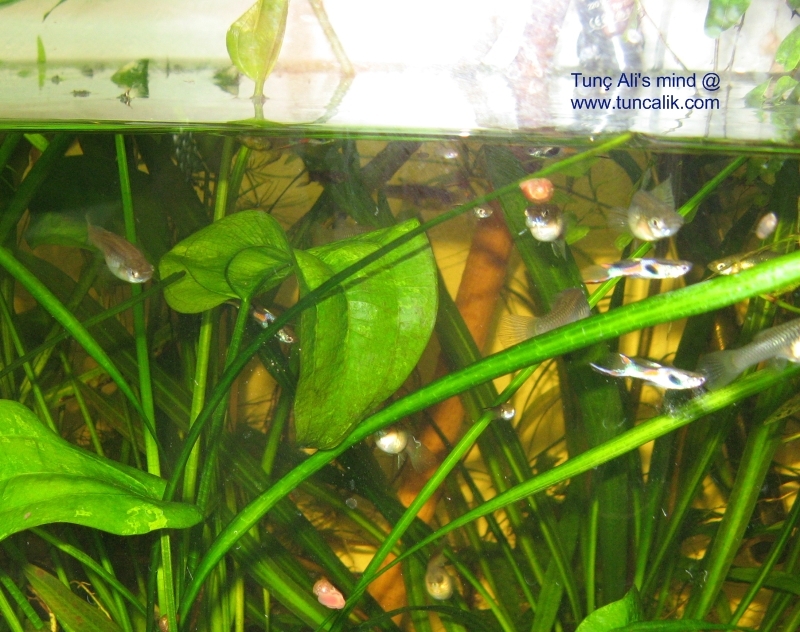 Then the number of guppies and the amount of feeding must be reduced. 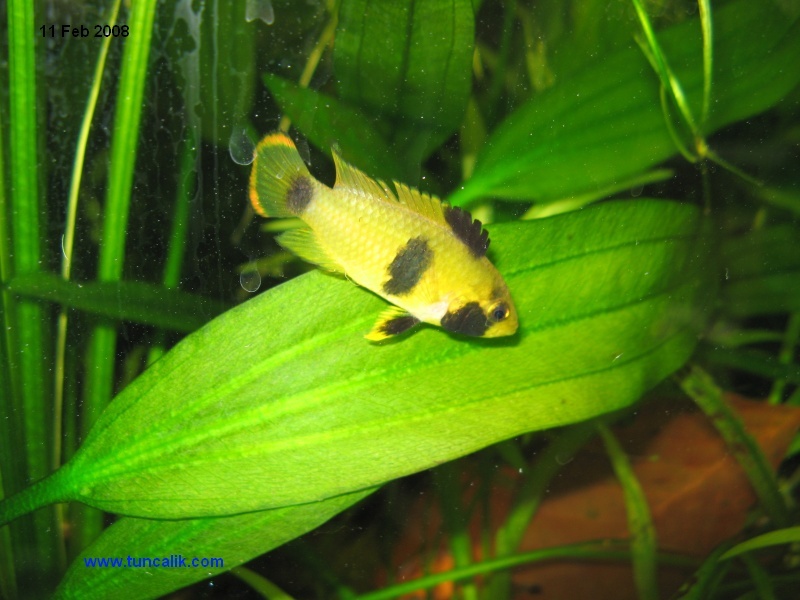 Yellow dwarf cichlids are apparently too slow to decimate the number of young guppies. 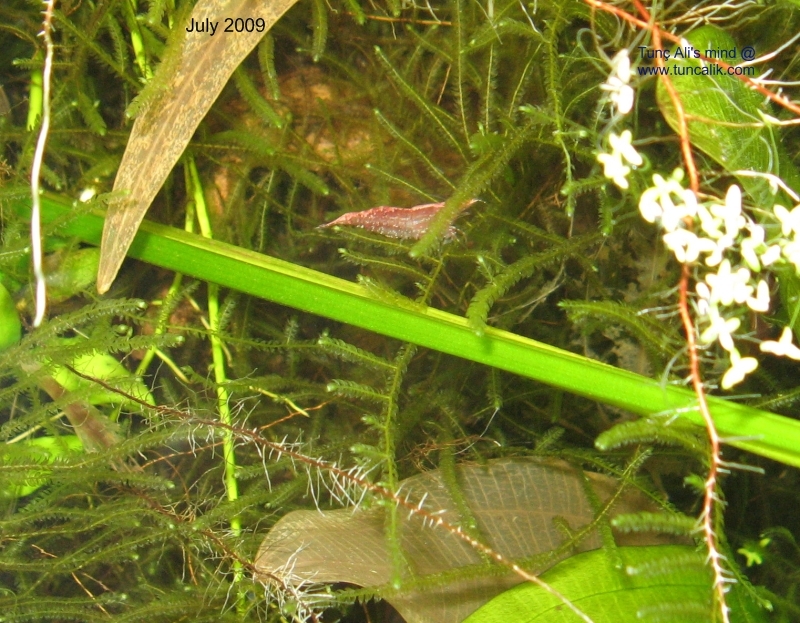 Most of the young shrimps are eaten by dwarf cichlids, but some manage to survive to keep the population stable. 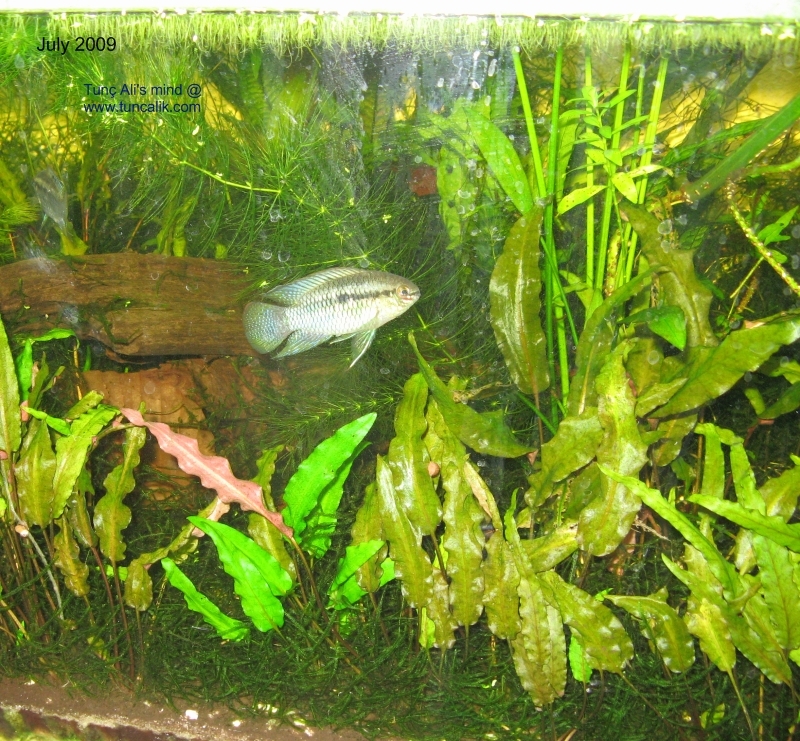 Two solitary Echionodorus species, E. osiris and E. uruguayensis grow very well in this aquarium. The trumpet (Melanoides tuberculata) and ramshorn (Planorbarius corneus) snails are very important for the recycling of organic matter. 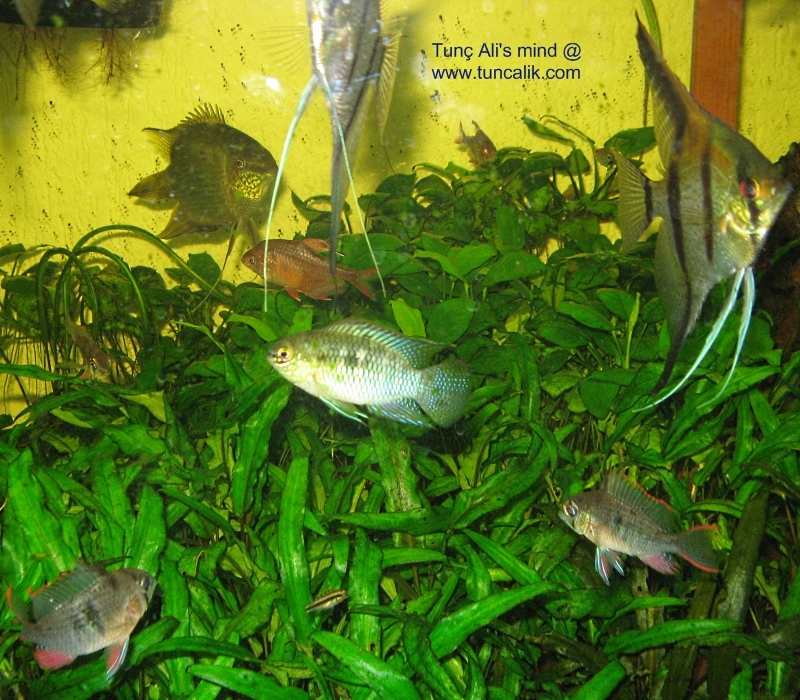 Two pairs of dwarf flag cichlids and a patriarchal cockatoo male (Apistogramma cacatuoides) with his two wives live in this aquarium. 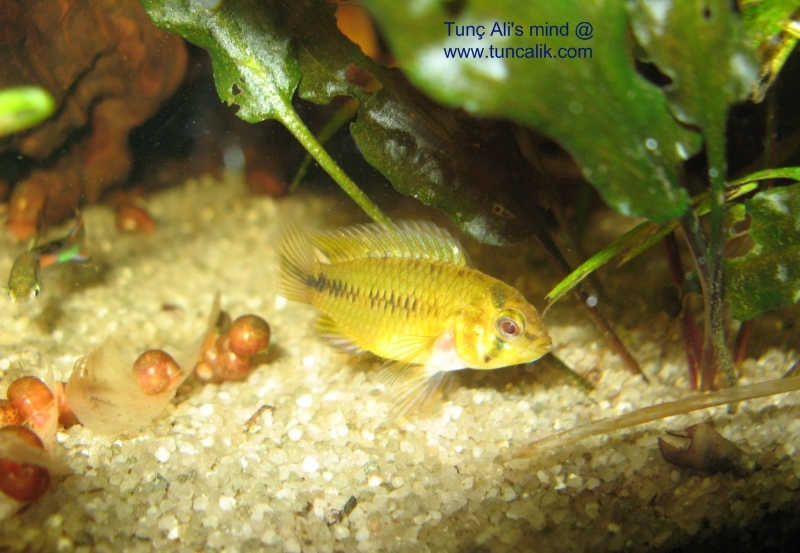 These two cichlid species get on surprisingly well. Since dwarf flags learned to respect the larger territory of the male cockatoo I witnessed no serious interspecial fights. Though seemingly dominant, the constant stress of keeping the robust dwarf flags under control might be too high a burden for the cockatoo male shortening his life; remains to be seen. On the other hand, I know that a cockatoo male needs a decent challenge to keep him busy and alert. 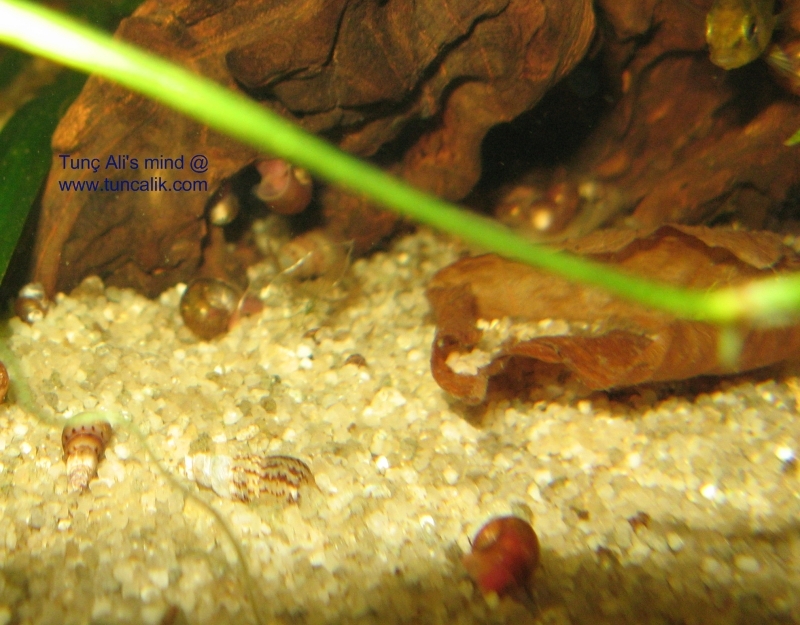 Ramshorn and trumpet snails, red claw shirmps (Macrobrachium assamense) and bristlenose algeaters (Ancistrus dolichopterus) share this aquarium with cichlids. 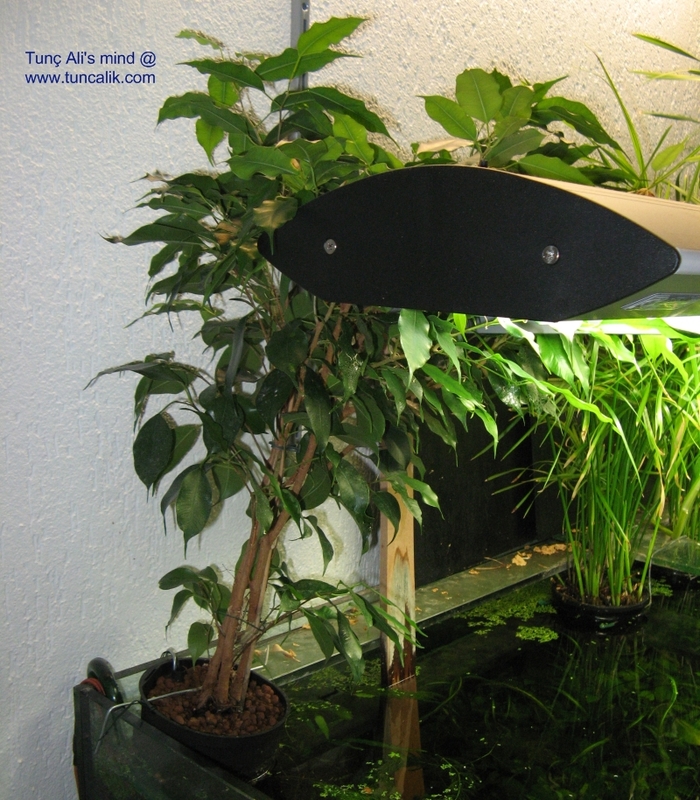 A simple sponge filter driven by an air pump cares for aeration and water circulation. 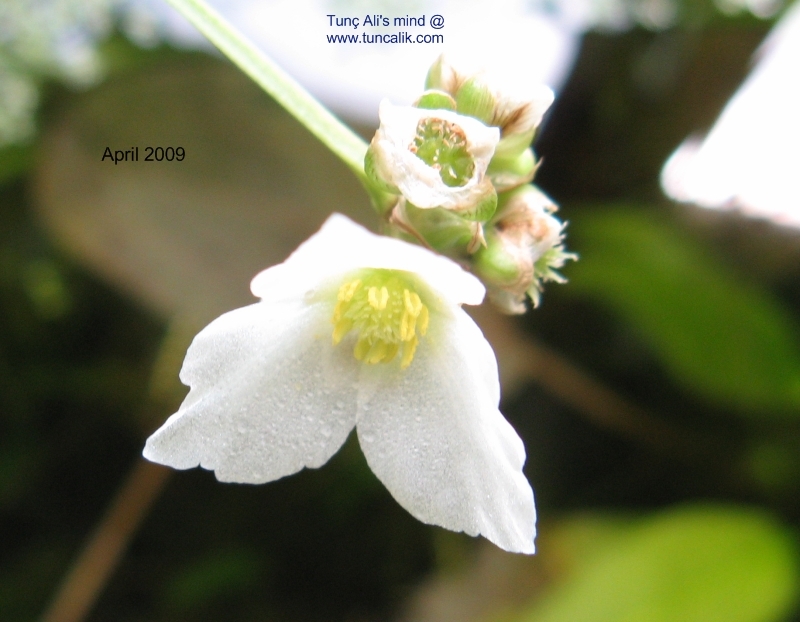 The temperature varies between 22 and 28 degrees celcius. 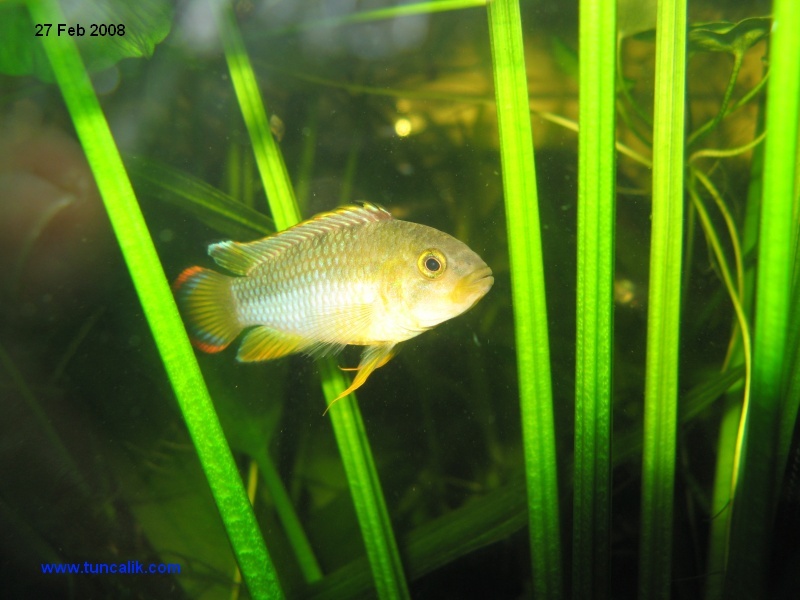 Thanks to low fish population and water purifying plants water remains very clean (nitrate levels less than 12.5 mg/liter); perfectly adequate for sensitive dwarf cichlids. 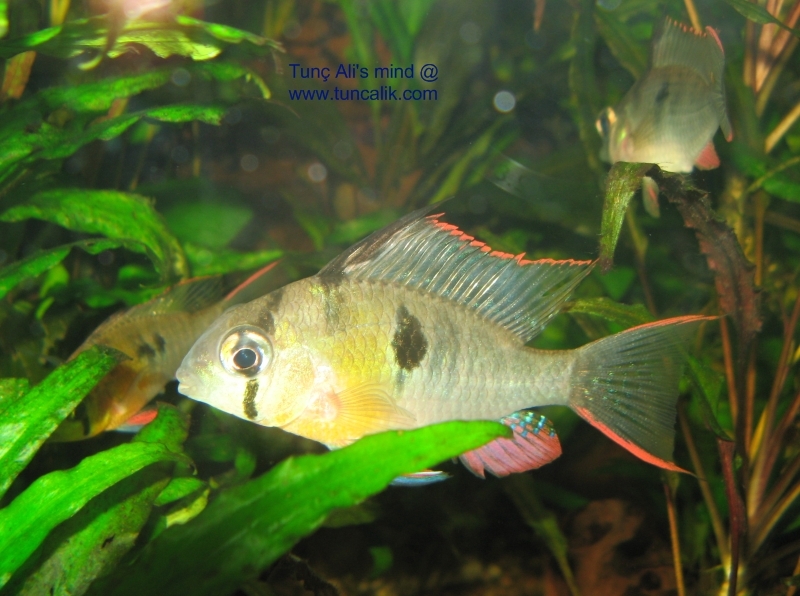 Panda dwarf cichlids (Apistogramma nijsseni) in the aquarium on the left handside with snails, guppies and a catfish (Ancistrus). 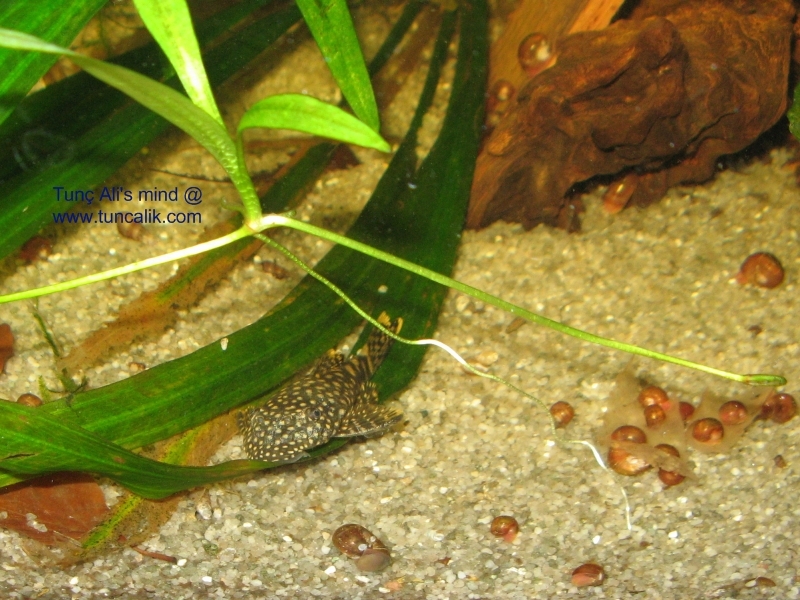 This entry was posted on Sunday, July 5th, 2009 and is filed under Natural aquariums. You can follow any responses to this entry through RSS 2.0. You can skip to the end and leave a response. Pinging is currently not allowed. 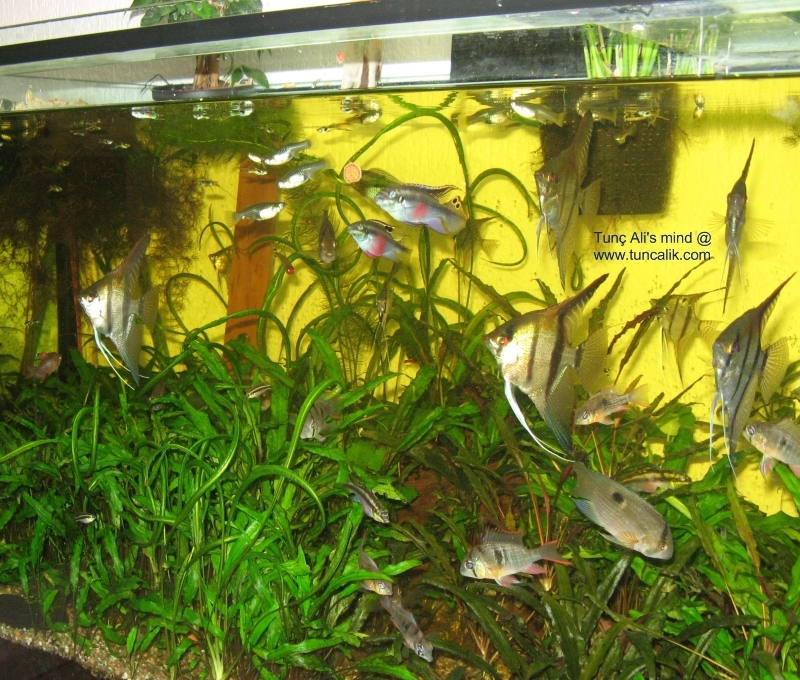 Nice aquariums. 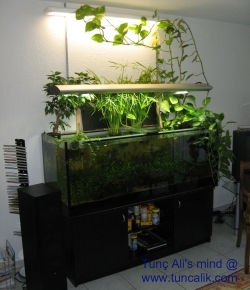 I like the idea of placing emergent and crowing plants above the aquarium. How do you place them? Just dip the roots in the water or you plant them in a pot and then put the pot in the water? If there is a pot, what soil do you have in it? 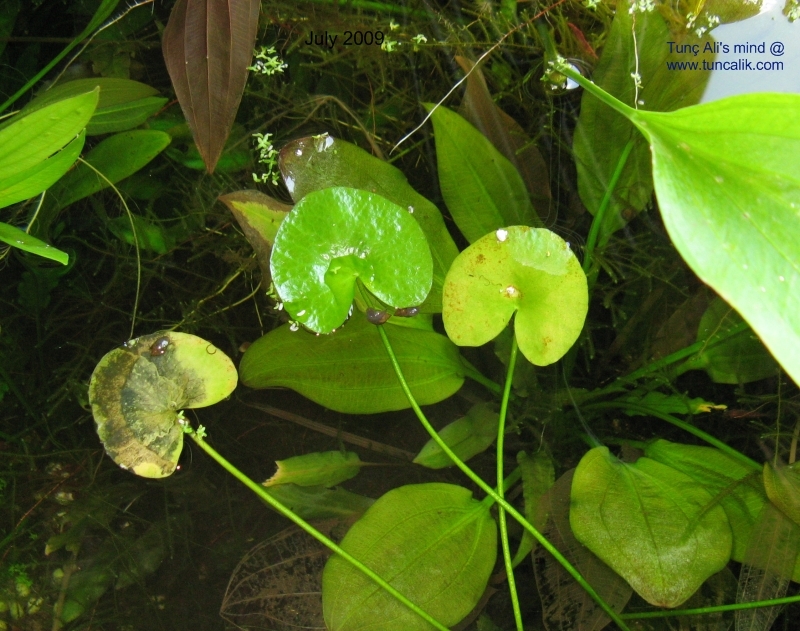 You can plant emergent plants like large Echinodorus sp. 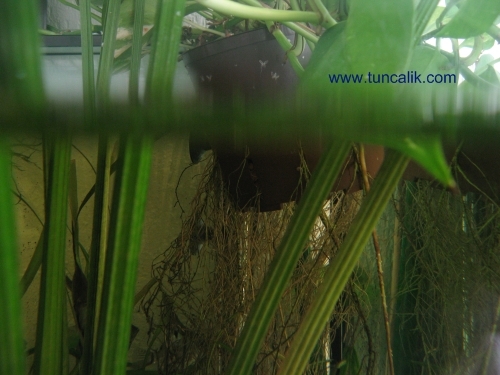 and umbrella (Cyperus alternifolius) directly to the bottom substrate of the aquarium provided that the water level is not deeper than 40cm. 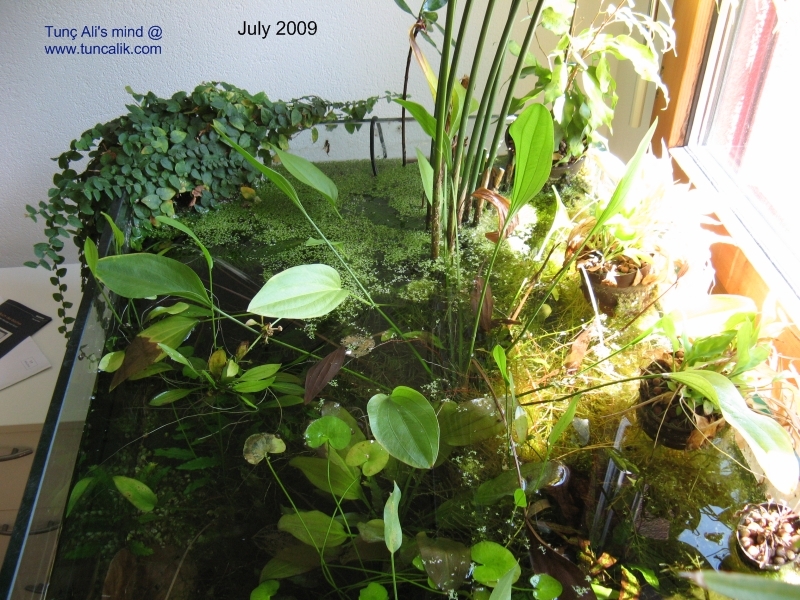 Otherwise, I generally use hydroculture pots filled with clay pebbles that I attach to a side glass of the aquarium. 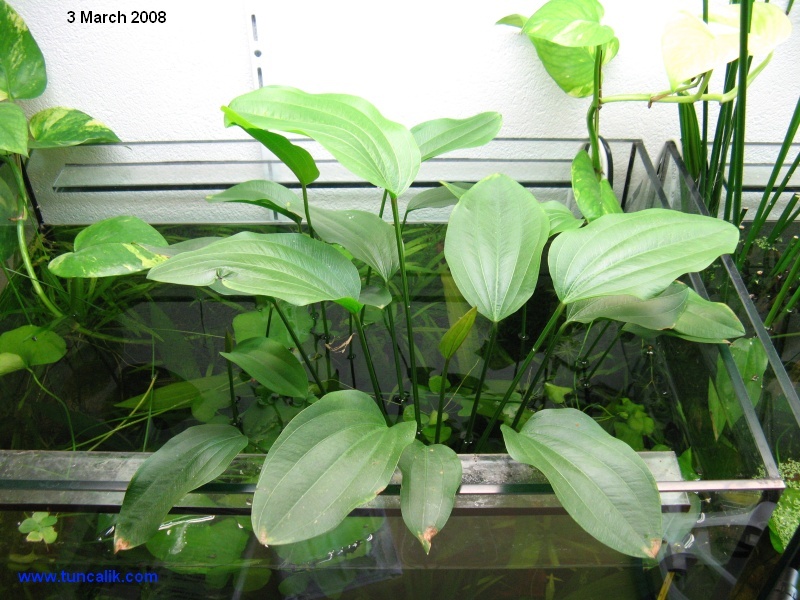 For epiphytes like golden pothos (Epipremnum pinnatum) you don’t even need a pot. You can just attach the stem to a side glass and let the roots float in water. The roots will soon find their way down to the bottom. Just love you tanks. Cannot wait to get my one set up. I have been reading up on the Walsted method. 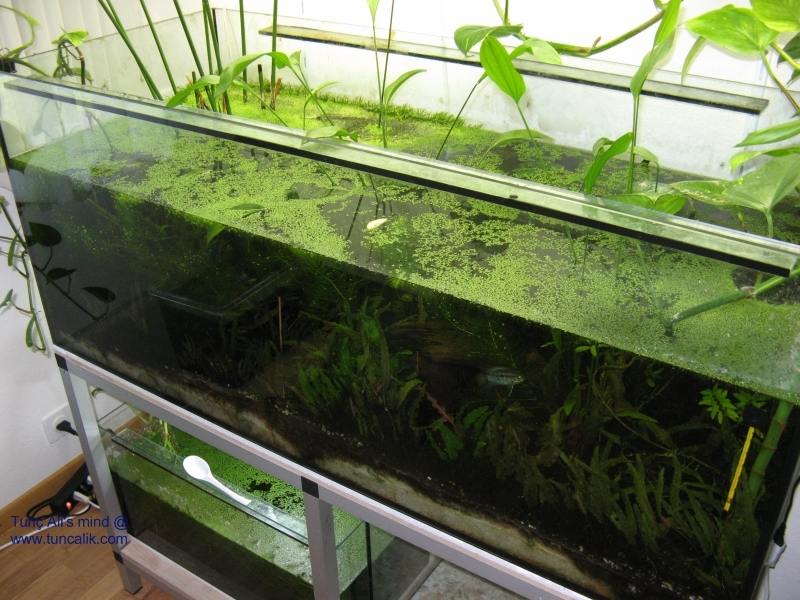 Hi there, I’m blown away by your low maintenance tanks! 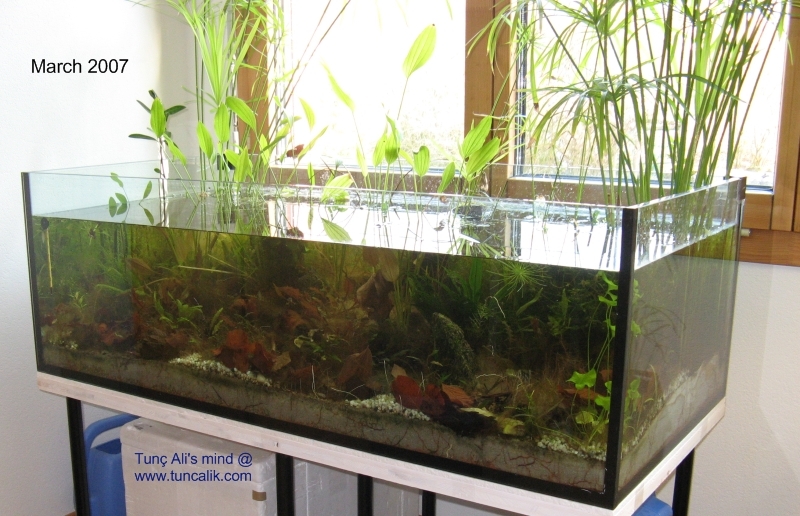 Apart from heating (and possibly lighting – as it is colder here in Wales) I would like to attempt much the same thing on a smaller scale, in fact on the nano scale, using a 12inchx12inchx12inch open topped aquarium. Do you think this is possible? 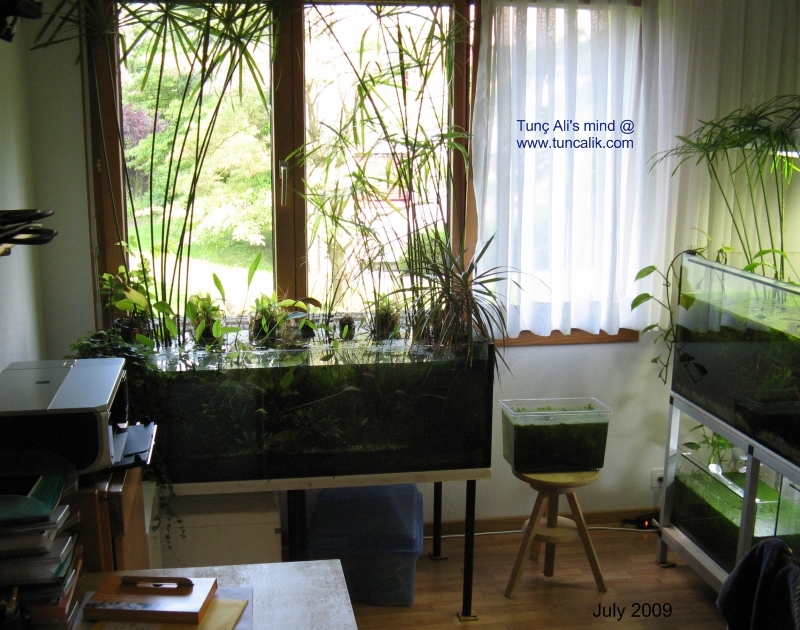 I have a few quick questions, if I were to add Cyperus alternifolius, what substrate would you reccomend (as a pot would take up too much room), and which plants in general, would you reccomend for such a small aquarium (to achieve a similar effect to you). for the first few times I could only say “wow”!!! I can’t explain how inspiring it is. I haven’t read Diana W., only read her name in connection with low-tech. I have something similar to yours in my mind but you made my thoughts real. Congratulations. 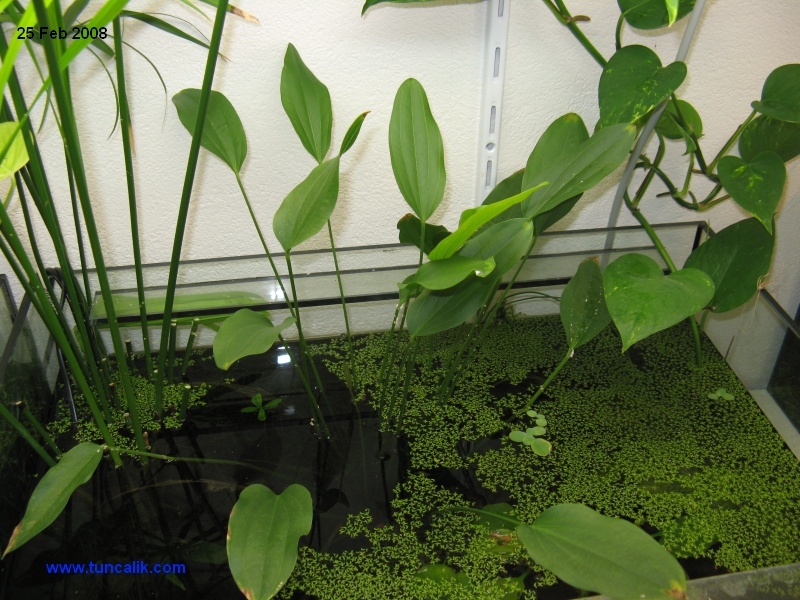 Do you make water changes? If not, what kind of water do you use to keep the water-level? Do you know something about mangrove ofr this purpose? The aquarium looks really great. It’s exotic and I love looking it. 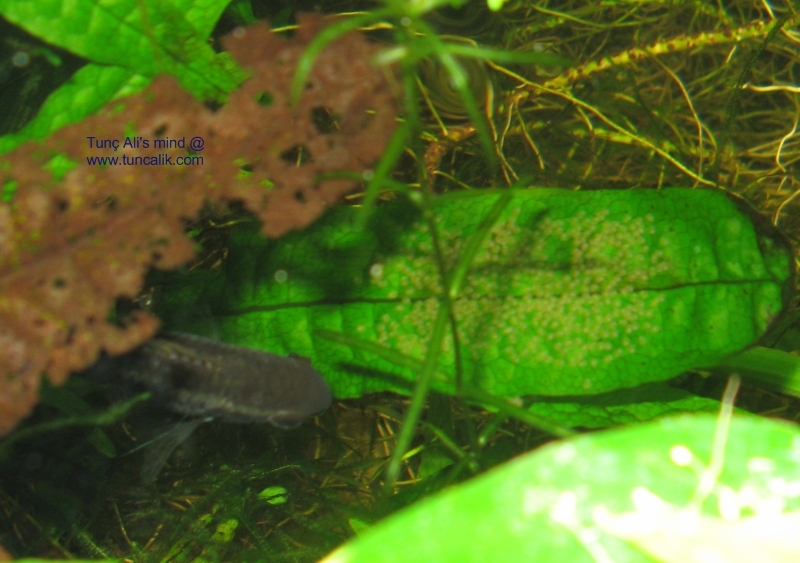 The fish had a nice shelter on the aquarium. 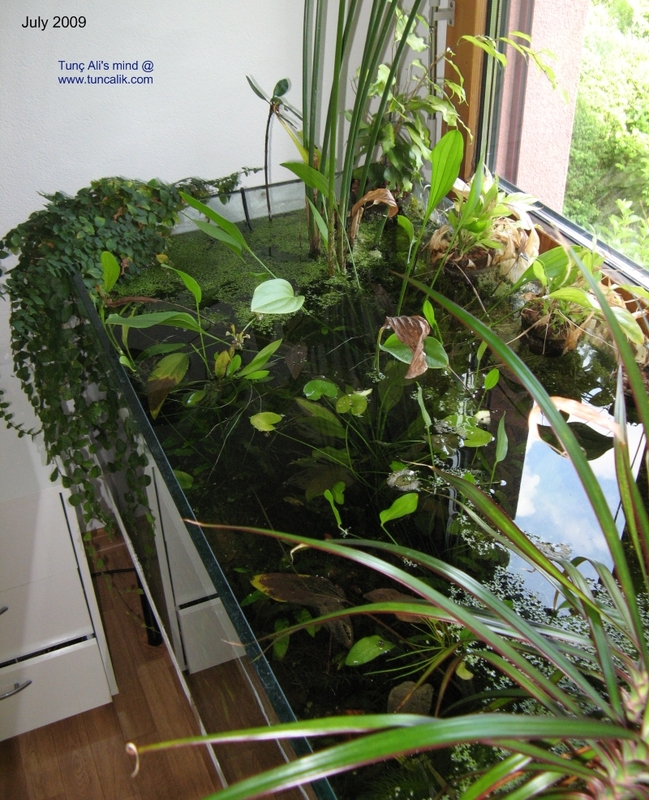 It’s a nice way of building an aquarium. All I can say is “WOW”. Congratulation, Your method is one of the best. WOW indeed. This is really incredible. 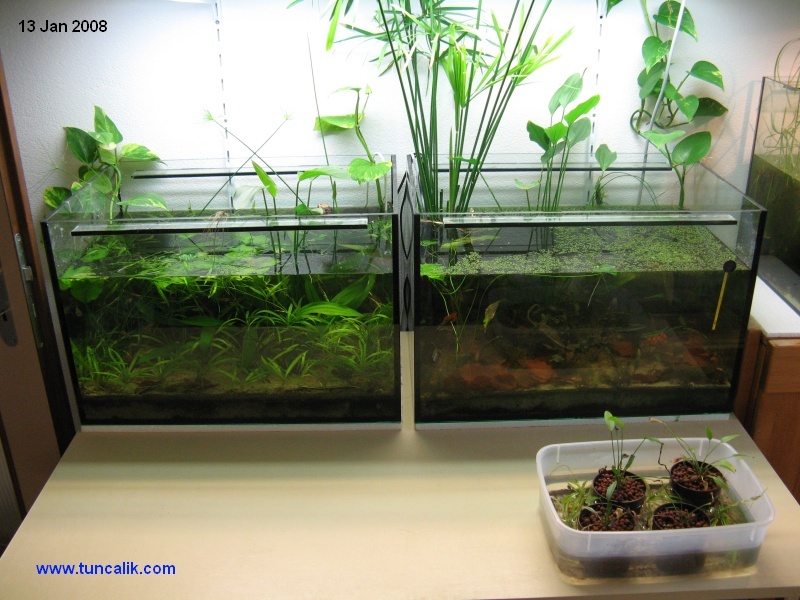 I can’t imagine how much time and work your aquariums take. Such dedication. I am terrible at keeping these types of things alive and thriving, so I really appreciate those who can. wow, that is so awesome. 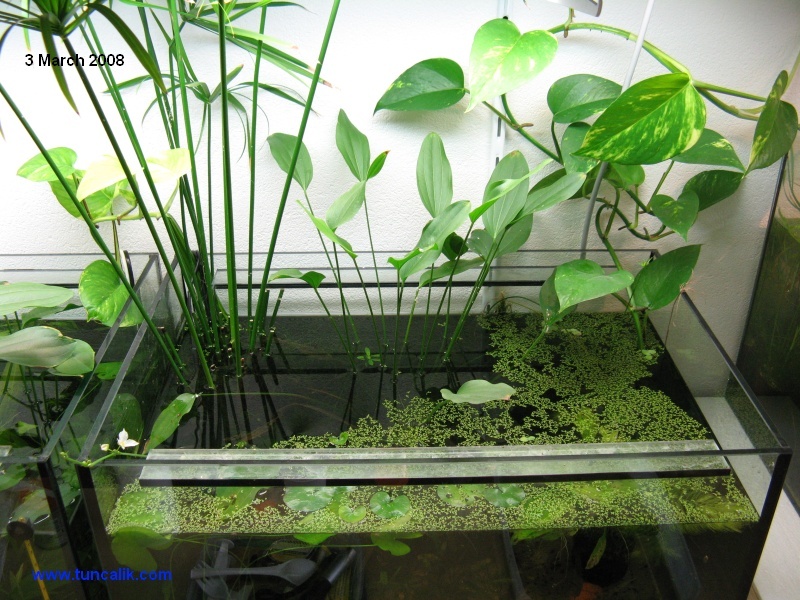 I want to start a home aquarium too. A neighbor of mine has such a fantastic setup- people actually pay to enter his home and see his setup. 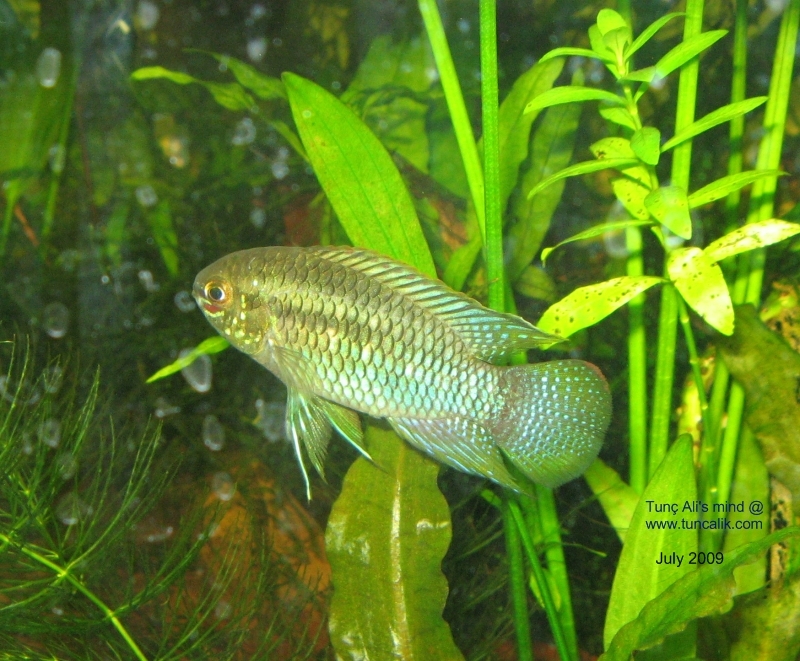 He has rare breeds of fish swimming around, it’s amazing. I will try sneaking some photos, although he doesn’t really allow it. Thanks, your setup is pretty great as well. 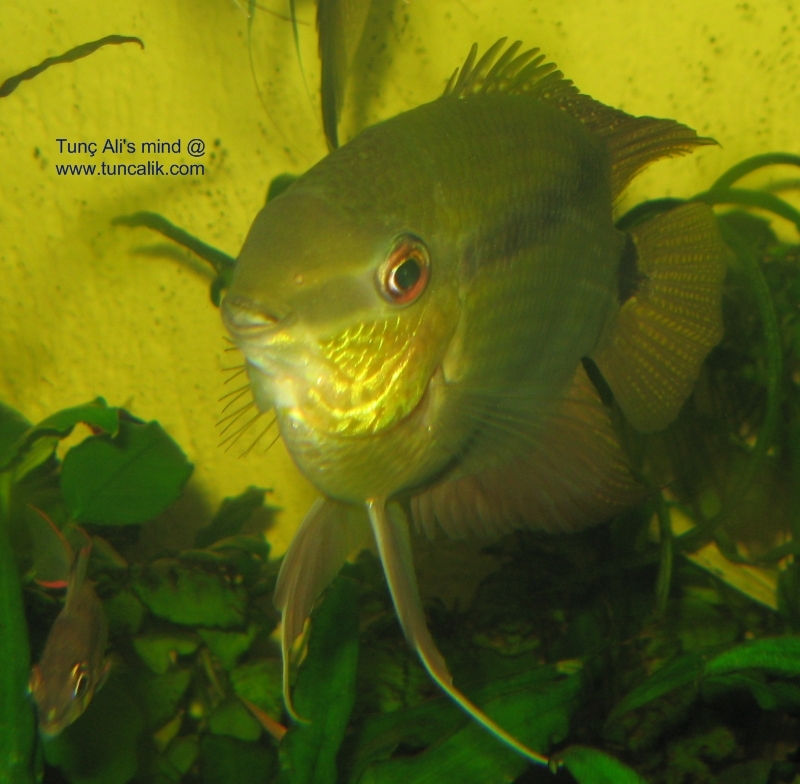 Abbs, it isn’t that easy starting a home aquarium just like that, specially such a complex one. It requires a whole lot of dedication. 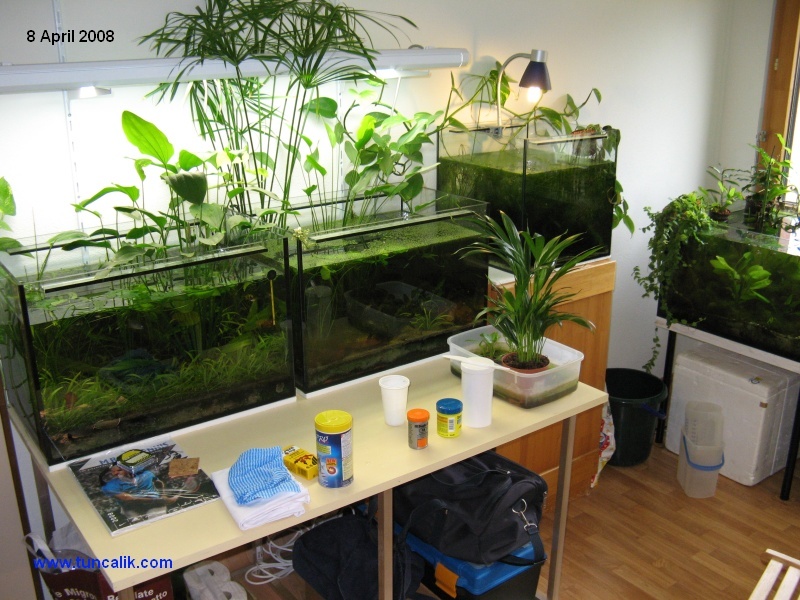 But wow, you know someone with a better aquarium than the ones in these pictures? I would honestly like to see it. Please do come back with some pics. Would appreciate it. Hi Tuncalik! your aquariums are such an ispiration for me. 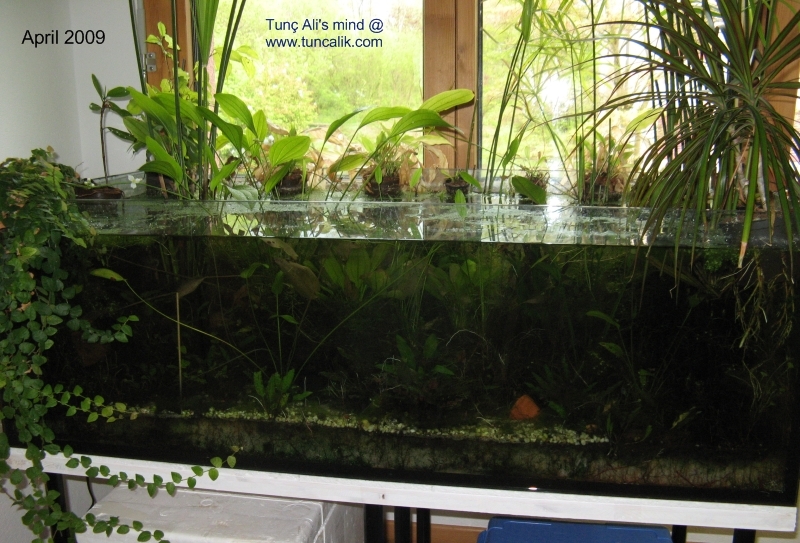 I’m planning to convert my acquarium full of filters and pumps in a low tech tank. 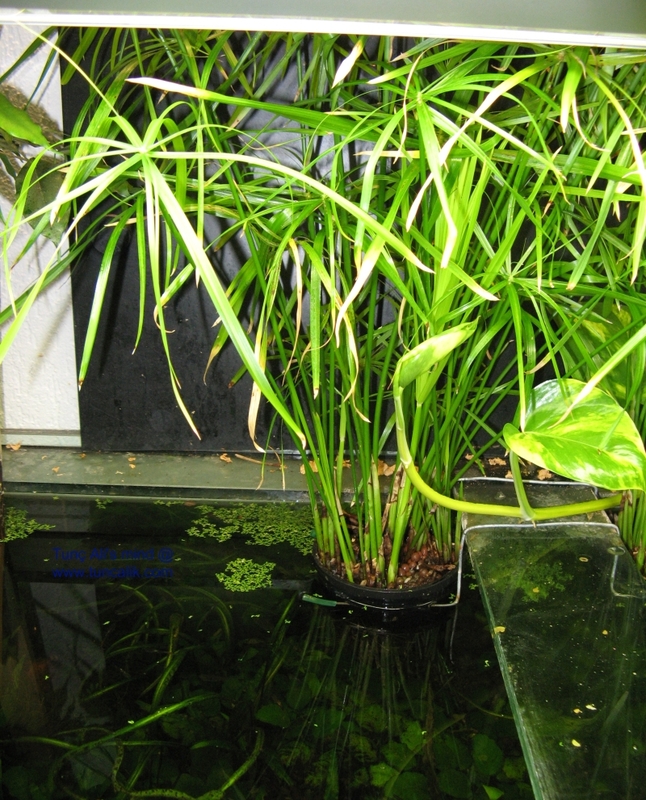 I have some echinodorus paeleifolius emerged,some pothos and some syngonium,and a lot of vallisneria. 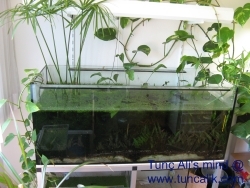 The tank is 150cm x 55x 45cm. 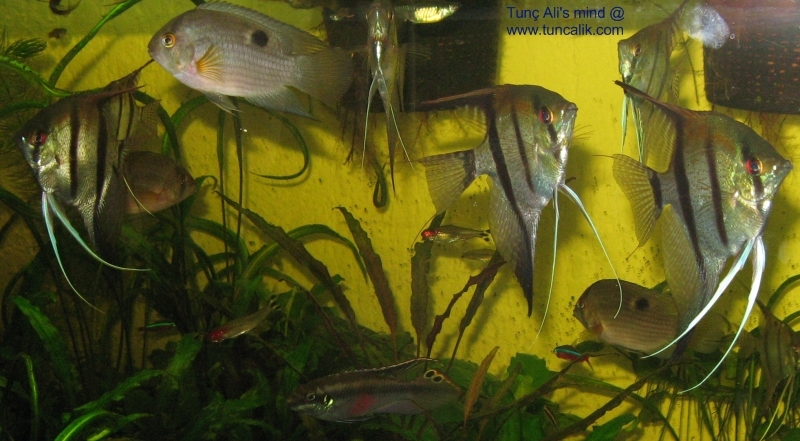 I house 5 T.meeki and a shoal of poecilia salvatoris and some corydoras elegans. 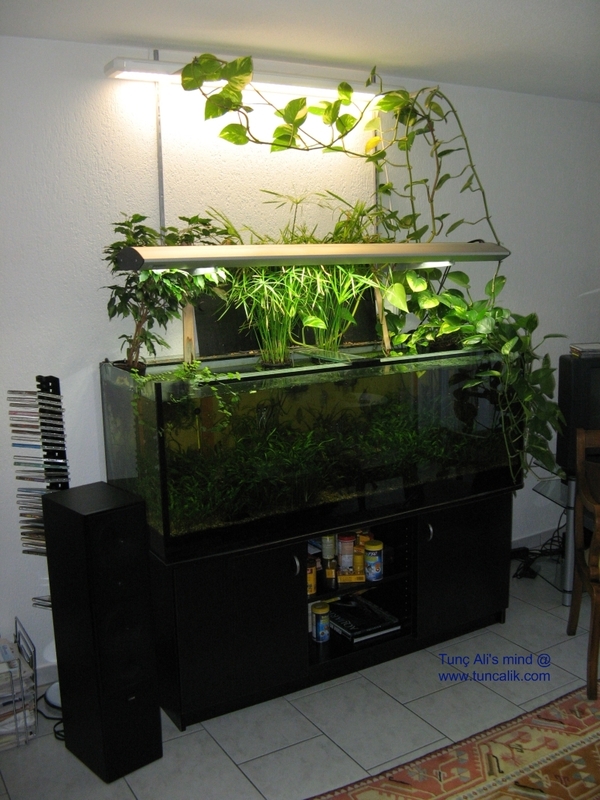 I wanna know if there is a kind of order for planting the tank..for example:first plants the pothos,second the echinodorus etc.